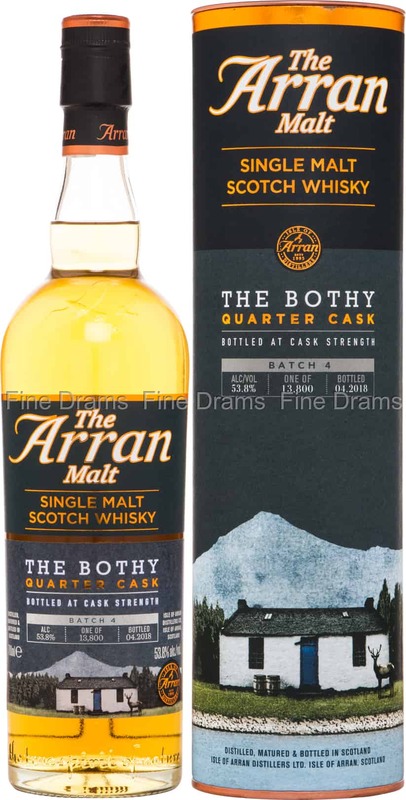 Matured in former Bourbon quarter casks, this is the fourth edition of this series from Arran distillery, which recalls whiskies from another age, which were aged in smaller barrels a quarter of the size of those used today. Bothy is the name given to to small shelters, often used by walkers during their hikes. The cozy comfort of these structures is recalled by the warmth of this dram, which is bottled at a cask strength of 53.8% ABV. The whisky is rich in buttery, vanilla-led Bourbon notes, with touches of toffee, barrel char, apples, warm malt, toasted bread, coriander, cinnamon, bright oak, and almonds. Just 13,800 bottles of this whisky are available worldwide. Another extremely good offering from Arran.